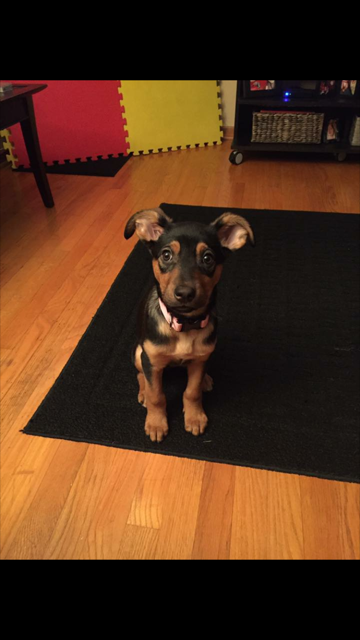 Sadie's story began as an "unwanted" puppy at a Humane Society in rural Arkansas. She and her siblings had been brought in by her former owner, who seemed to not care about little Sadie's life. Because she was in a rural area where pets are highly overpopulated and spay and neuter resources are scarce, euthanasia was a likely possibility for Sadie. At a very young age, Sadie found herself in a situation where her future was highly uncertain. Things finally changed for Sadie when Wright-Way Rescue pledged to save her life. After a 298 mile drive, Wright-Way’s Rescue Team arrived in Arkansas to rescue her. When Sadie arrived at Wright-Way, she was immediately greeted by a team of people who were anxious to help her find the home she deserved. Sadie felt loved, and she finally thought she was safe. Unfortunately Sadie was faced with another, seemingly impossible challenge. She was diagnosed with a severe heart murmur. A veterinary cardiologist confirmed the worst: Sadie would require a difficult and costly surgery in order to have a chance of survival. Her condition was so severe that immediate surgery at Purdue University was required to save Sadie's life. Her adoptive owner knew that Sadie was special and that she had already come a long way to find happiness. As a first responder, her adopter knew that Sadie needed him to live a long and happy life, the one she deserved. Initial exams after Sadie’s surgery pointed toward it being successful, and a bright future ahead for little Sadie. Despite Sadie making it through the surgery, today we are asking you to contribute towards Sadie's recheck appointment and ultrasound. These will hopefully tell us that Sadie's surgery was a success. It took dozens of people to make Sadie's rescue possible. From the Wright-Way Rescue Team to our adoptive families, they all make our lifesaving work possible. Will you help Sadie and Wright-Way Rescue by making a tax-deductible donation? Your one time donation or a monthly contribution will help Sadie, as well as other special needs pets just like her.